How to tie a Purcell Prusik from a single end? 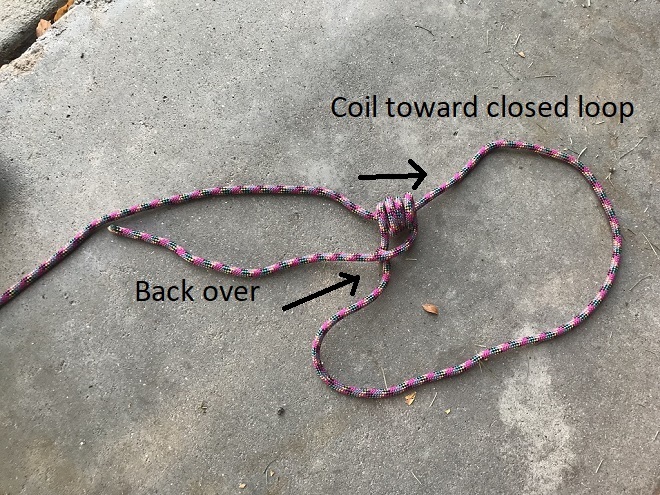 There is the regular Purcell Prusik, which can be used for adjustable tethers or create foot loops for ascending a rope, but it is also useful to know how to tie it with only one end of the rope instead of a loop. 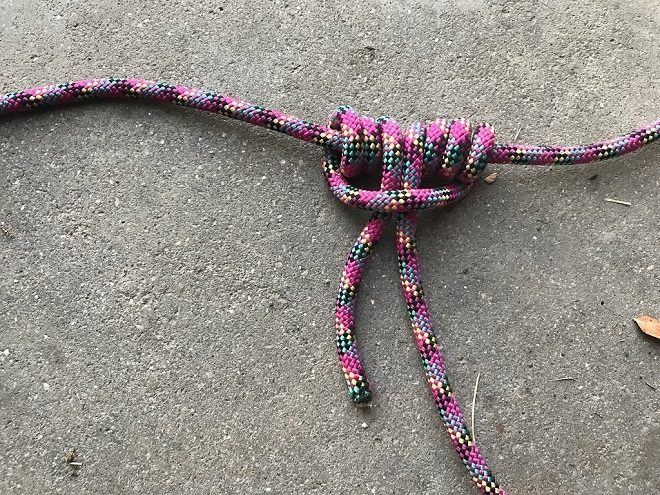 This knot is useful for tightening lines holding tarps out for example, how would one tie it? Note: This knot works better in smaller diameter cords, but its easier to demonstrate with larger ones so that is what is in the pictures. 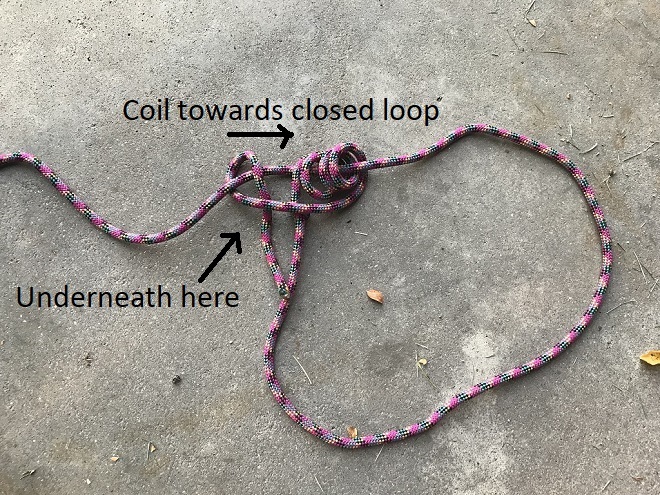 To start with you go over the top of the rope and then do 2-3 coils back towards the what will be the closed loop before bring it back over where you started. Then you coil again 2-3 coils in the direction of the closed loop making the coils on that side match the other. 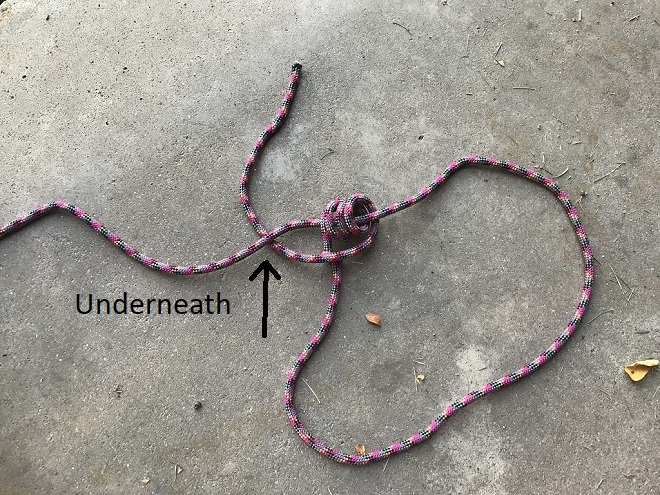 The advantage of this knot for adjusting tie down strings on tarps and tents is that you can slide the knot towards the tent to get it tight and then the prusik will hold it in place. It's fairly easy to untie because only one end of the prusik has tension on it, you can just undo the unweighted side and then the other will come right off. Do note that it's the coils towards the closed loop that will take the weight, sometimes its worth putting 4-6 coils on that side and only 2 on the unweighted side. Not the answer you're looking for? Browse other questions tagged knots prusik or ask your own question. How to do a prussik with end of cordellete only?